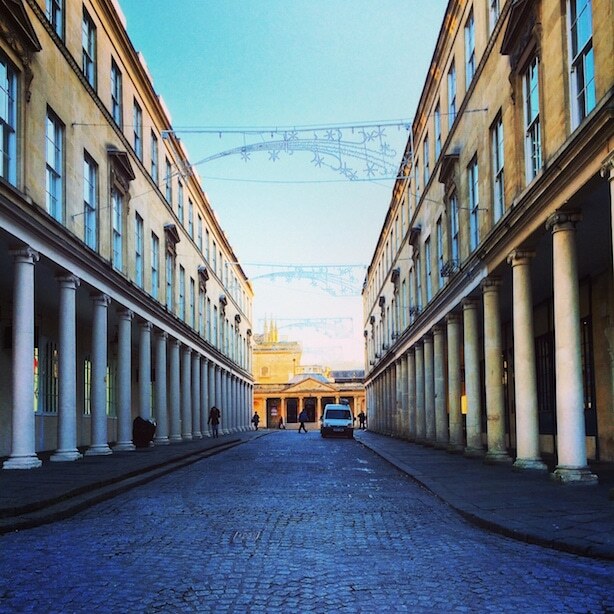 As you know, I and LM popped off to Bath for a few days at the very beginning of 2015. We stayed at the glorious Queensberry Hotel and spent our time seeing and doing and eating and discovering some of the loveliest spots in Bath. 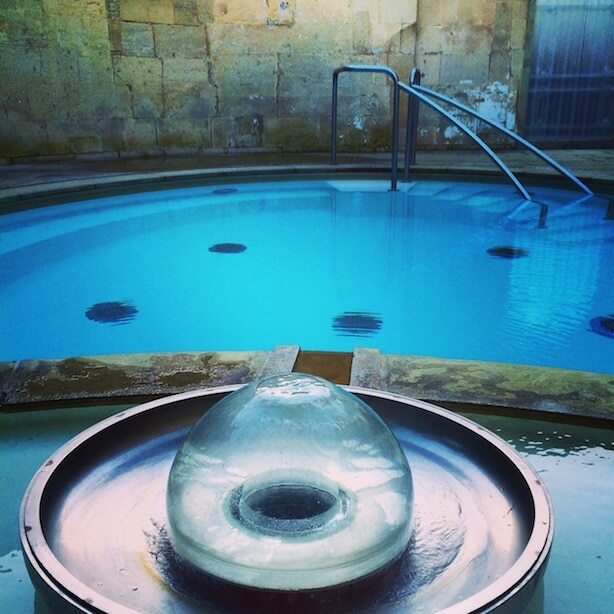 One of the highlights of our mini break was our morning at Thermae Bath Spa. What a magical place.. and what stories it has to tell! 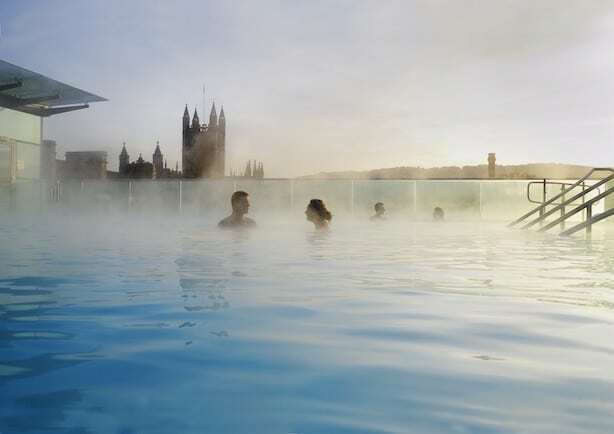 Did you know that Bath is is the only place in the UK where you can bathe in warm, mineral-rich thermal waters, which come directly from the natural hot springs? Well it is. It’s unbelievable. And this is also why the entire city is now a World Heritage Site… and rightly so. 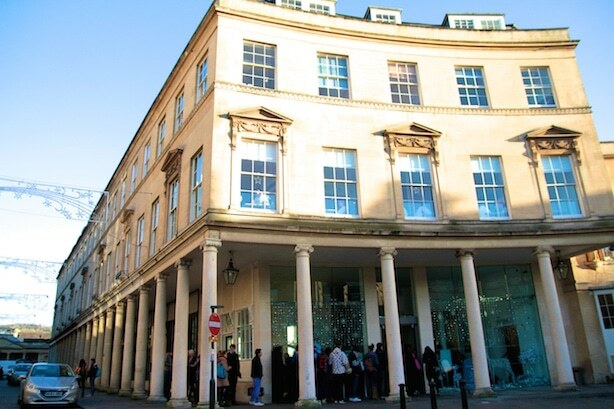 The springs are situated deep beneath the city and there is actually archaeological evidence that there were people hanging about the hot springs (on which the City of Bath is built) at least 8,000 years B.C! That folks, is a very long time ago. You can imagine how amazing this was for people to discover… and the Romans, (who rather liked claiming things for themselves) built an actual reservoir (but how? No power tools then y’know) around the hot springs, and then a rather sophisticated series of baths. The picture above is of The Cross Bath, which is now recognised as an official sacred site. 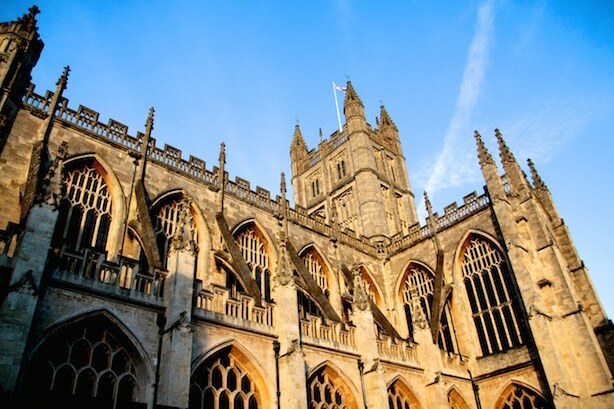 The Celts revered their goddess Sul here, in whose honour the Romans named their spa town, Aquae Sulis… the history is phenomenal and rather overwhelming. That, and the fact that you know you are bathing in water that’s millions of years old. LM and I arrived on Saturday morning, just before this queue had gone around the building.. we picked up our wristbands, robes, towels and slippers (SPA READY!) and headed into the changing rooms with its very snazzy locker system – just zap your wristband and bish bash bosh. We both had massages booked and were in dire need. I was coughing and spluttering and LM was headachey and ouchy. Massages were in need and what better place to have them. I was booked in for the Aromatherapy Massage, while LM had the Full Body Massage. I love aromatherapy massages as I’m a bit of a wimp. I’m not very good at pressure around my back or shoulders – what makes most people sigh with happiness, makes me writhe in agony and want to leap off the table and punch the mean person that’s inflicting the eye-watering pain… so this light-pressured massage was perfect for me. I also chose some oils which aided the respiratory system, so I was breathing much better afterwards as well. 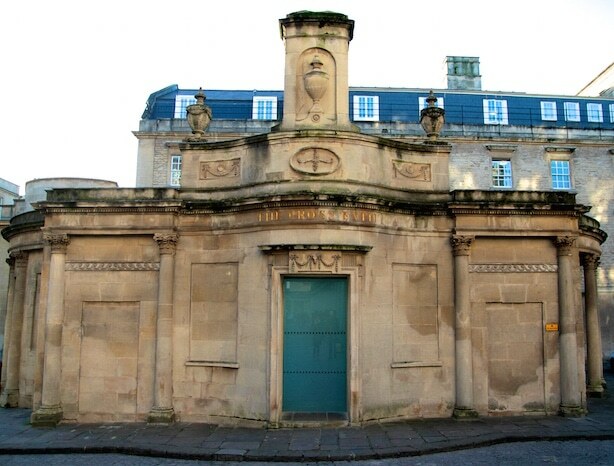 Minerva Bath – named after the Roman Goddess of Health & Wisdom, this is the largest of the thermal baths. The room was warm, dimly lit, charming and cosy. The towels were as soft as marshmallows and I fell asleep. Properly. Just for a moment, but I knew I was asleep because I woke up when she dinged her Indian bells. I hope I didn’t snore. We were both incredibly relaxed afterwards.. and feeling ready for a swim. This was PERFECT for me! Each of the four circular pods had a different infused vapour, and so I headed straight for the eucalyptus mint. Vicks nasal spray, eat your heart out – this was like magic. An instant cure for my cold! There was also lovely large ‘waterfall’ shower, which has various settings, including a light misting of water.. and a strong shoulder-pounding shower. We stayed here for around 20 minutes, going in and out of the various steam rooms and then ducking under the shower to cool off… and then, when we were nice and steamed, we headed up to the rooftop pool. It was rather chilly when we got out the pool (it’s JANUARY for heaven’s sake) but we quickly shimmied back into our robes and and scampered down to Springs Café Restaurant, where we enjoyed an extremely delicious lunch of Salmon Salad Nicoise, fresh juice and mint tea. 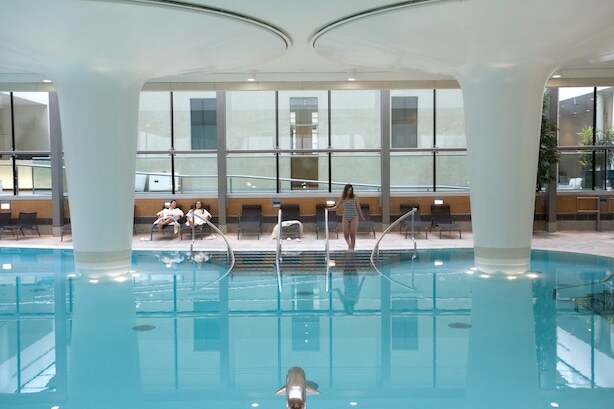 LM and I were guests of Thermae Bath Spa. And if I hadn’t loved it, I wouldn’t have written about it. We went to Bath for my niece’s hen weekend. 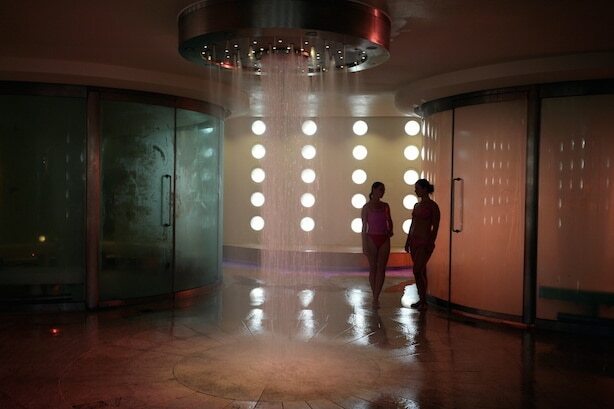 The Thermae Bath Spa was the perfect ending to a fabulous weekend. Always wanted to go to Bath! Looks lovely! Massage for the whole body is not only useful, but also pleasant. I agree with that. I often go to massage parlors to relax both in body and soul. Recently, my friend advised me to visit a https://aloha-spa.com.ua/en/, without thinking twice, I decided on this procedure. It sure looks historic and quite the relaxing and take you back in time kind of visit. Would definitely include this ideal bath tub once I visit the UK.